Hypnosis has been approved for the use of pain by the American Medical Association since 1958, and the British Medical Association since 1957. Often, hypnosis for pain management has been thought of as being a form of alternative medicine by the public, and some hypnosis professionals. However, hypnosis has been recognized as a valid treatment for pain by the AMA and BMA (both the management of chronic pain as well as for both for analgesia and anesthesia). This means that hypnosis is really is a recognized treatment in medicine (even though hypnosis is underused). As a hypnosis professional you need to know that you do not need to be a doctor, nurse, or chiropractor to provide this hypnosis service. And, since you are not a medical professional it is best if you position yourself and your hypnosis services as being “complementary” to the work done by the licensed medical professionals. Here are some tips that you can use if you want to get into this important and lucrative part of the hypnosis profession. First, get the very best hypnosis training for pain management that you can. This does not necessarily need to be a long course in a live classroom. I like to recommend that you look into getting a hypnosis video training course for this kind of training because you can easily review parts of the course any time you want to. The best such course that I know of was written and produced by Ron Eslinger and is called, HypnoAnesthesia for Pain Management. This ability to review the hypnosis training is particularly important when you are preparing to see your first pain management clients. It is also important because when you first start offering hypnosis for pain management in your practice, because it may be an extended time between pain management clients, unless that is your specialty. When you have a hypnosis course on video, then you can review the course when you need to brush up on things that you have not done in a while. This way your hypnosis skills and confidence will always be high, even though you may not have seen a client for this issue in a while. Here is another important tip; make sure that you never provide hypnosis to work on the management of pain unless you have a doctor or other medical professional, who is qualified to diagnose pain related problems provide you with a document stating that it is safe to do so. This way you can be assured by that medical professional that the masking of pain will not interfere with proper medical work that is being carried out. It is very important that the hypnosis used for pain management does not neutralize pain that would signal the need for further treatment. An example of this kind of pain, pain that can be safely removed is phantom limb pain. In any case, only a medical professional can determine whether it is safe to remove pain. By the way, Ron Eslingers program shows you exactly how to successfully work with such clients. Before you start your hypnosis work with your pain management client, make sure you have this information in writing. Some doctors will willingly give you a referral to do the work, others will be willing to at least say that the work is not “contraindicated” which means it is not likely to harm the client. I recommend that you also get permission from your client to inform his or her doctor about the progress being made with the hypnosis treatment. When you are successful, you can then contact that doctor, and let him or her know of the successful hypnosis treatment of the pain. 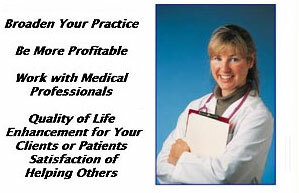 Do this in a professional way, and you will often receive many more referrals from that doctor in the future. Many doctors become frustrated with their inability, in many cases, to successfully treat chronic pain. If you can show them that you can successfully treat pain with hypnosis, then they will become a source for many more clients in the future.